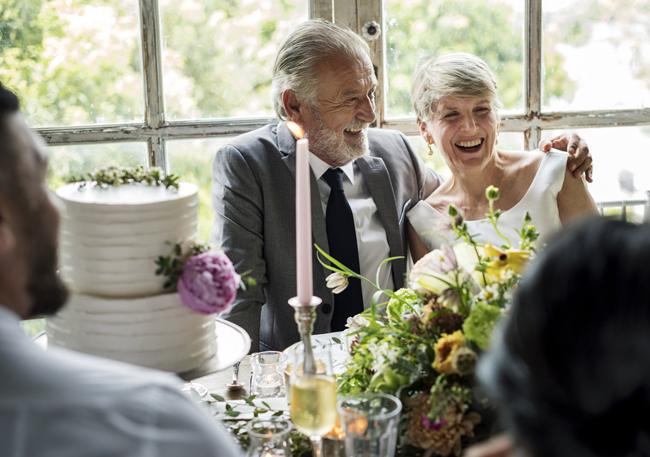 Traditions like throwing the bouquet and cutting the cake are celebratory, but are they appropriate beyond the first wedding? My upcoming marriage will be my third, and my fiance’s second. We originally planned to have a small gathering, but because of the size of his family it is turning into a larger celebration. My question is if a bouquet/garter toss and cake cutting is appropriate for our third/second wedding. I don’t want to be tacky. Any help is appreciated! Thank you for writing. When it comes to weddings that are not you or your partner’s first marriage, you may receive conflicting advice. In today’s world, second and even third marriages are very common. The prevailing thought is that you should have any type of wedding that you want, taking into consideration the feelings of others involved. The items you mentioned are traditions and can be included or excluded depending what you want. There are no rules against having these traditions at your second or third wedding; it’s totally your preference. Personally, I’m not a big fan of the garter toss, simply because it’s sometimes done in poor taste. Looking up how these traditions evolved can be fun. It’s supposed to be good luck for the groomsman that catches the garter — but its origins come from stealing the bride’s clothing to bring that good luck. It was also thought to be proof of marriage consummation brought out of the bedroom by the “witnesses”— no, I’m not kidding! Both throwing the garter and tossing the bouquet are completely optional activities, and you can do one without doing the other. You can also choose to give your bouquet to someone special, such as the couple married the longest, your maid of honor, sister, or any other special guest. If you are planning to have a wedding cake, I do recommend a traditional “cutting of the cake.” It’s the time-honored signal that it’s okay for guests to say their farewells and depart without appearing rude. This mostly applies to elderly guests whom find a long reception too tiring; and there are usually other guests that may prefer an early evening as well. If you really don’t want to “cut the cake,” you can choose another way to signal to your guests that it’s OK to say goodnight. Making the rounds and thanking your guests for coming might be a good option. Just because your event has grown larger than you wanted, you don’t have to change the way you want the wedding and reception to unfold. Skip any tradition that makes you feel uncomfortable. AskCheryl: Etiquette of a Second Wedding— Anything Goes!